Believe it or not, there are actually several different types of golf bags available on the market today. Different golf bags have different purposes and it is important to buy yourself a golf bag that is not only appropriate for your local weather conditions, but that it also appropriate for holding all of the golfing tools that you plan on bringing with you. In a hurry? Click here for our #1 golf bag pick at Amazon. It is also extremely important that your golf bag is large enough to hold all of the golf clubs that you want to bring out with you on your golfing trip. There are a lot of things to consider before buying one of these, and we share our tips with you below on what to look for when shopping. We also share our recommendations for the best golf bags on the market right now to make the decision easier for you. What kind of material should a golf bag be made out of? What should I put in my golf bag? Where should I store my golf bag in the off season? What features should I look for in a golf bag? How long do golf bags last? It is important to buy a bag large enough to hold all of your golf clubs so that the grips of the clubs are spread out and don’t rub against each other. If your golf clubs are too close together they can rub and cause your grips to rip, crack or even break over a long period of time. Grip repairs and buying new clubs can get extremely expensive very fast and this is something that is completely avoidable as long as you have a proper golf bag for your golf clubs. Staff bag: One of the most popular types of golf bags on the market, the staff bag is top of the pack in the golf bag world. Professional golfers and amateur golfers alike use this type of bag to carry their clubs around in. They are quite heavy bags, but they are capable of holding plenty of clubs; if you are worried you have too many clubs and you don’t want your grips rubbing then this may be the type of bag that you want to look into. This type of bag is heavy but you can still put this bag on both a riding cart, it should have straps to carry it on your shoulder, and it can easily clip into a hand cart so that you can walk the course and pull it around behind you. These bags are the best of the best for storage space for clubs, as well as for all of your golfing gadgets. Cart bags: These types of bags are still very popular golf bags; although they aren’t quite as large as staff bags, they do have the added bonus of being lighter. These types of bags are designed to be either thrown on the back of a riding golf cart, or strapped to the back of a pulling cart. They are designed so that when this bag is attached to the cart you still have easy access to all of the bag’s pockets as well as your clubs. Generally speaking these golf bags will have some kind of a rubber base on them so that they don’t fall off of your cart. Stand bags: Pretty much exactly what you think when you read the name, these types of bags are capable of standing up on their own. They generally have a mechanical system built into their design that contains two retractable legs that pop out when you lean the bag over to one side. 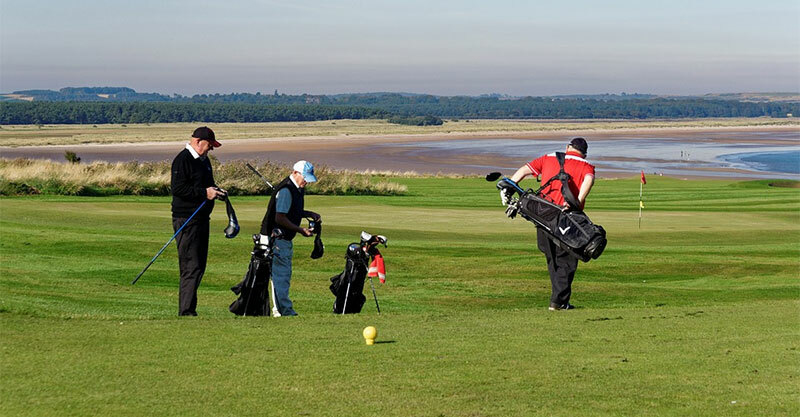 Golfers that like to walk around the course generally prefer to have a stand bag so that they don’t have to set their clubs on the ground or don’t have to worry about them falling over when they walk over to hit their ball. One nice thing about stand bags is that they are still the proper size to fit onto a cart whether that be a pull cart or a riding cart. Carrying bags: These types of bags are unique in the way that they are the lightest type of golf bag available. Like the name reads, these golf bags are meant to be carried around on your shoulder and do not contain a stand to help hold the bags up while you go to hit your ball. Unfortunately this also means that they have less pockets and features than the other types of golf bags and are often a lot smaller in size and therefore capable of holding less clubs. Generally in other types of golf bags you will see a lot of dividers on the top half of the bag to help separate your clubs and keep the grips from rubbing together, these golf bags generally only have a couple of dividers and one potential fault of these bags is torn grips due to excessive rubbing if you try and store too many clubs in the bag at one time. These are most often the cheapest type of golf bag on the market and if you are new to golf then this might be the type of bag that you are interested in. Golf bags not only come in all sorts of shapes, sizes and types, they especially come in all different kinds of materials. Some materials are a lot better than others and depending on how well known of a brand you buy; you are going to see a large difference in the overall construction of the bag. A poorly manufactured bag is not going to last you for as long and you may have to even do repairs on it down the road. Leather: A leather golf bag can last for a long period of time, the thing about leather is that if you do not coat it properly it can be more prone to ripping as well as fading in sun light. Even if you store your leather golf bag inside, you may still find that it loses some of its colour over a long period of time. Plastic and fabric combination: This is generally the most common type of golf bag and you will find that the majority of golf bags are made this way. The good thing about being made of plastic and fabric is that although some of the parts may be breakable, the golf bag itself generally stays intact for a longer period of time. Generally it requires some kind of brute force to break your bag rather than wear and tear. You will also notice that with these types of bags, you will rarely encounter fading of color from the sun. Plastic: You will find some bags that are made purely of a plastic material, generally these bags are prone to ripping, as well as fading. The thing about a plastic golf bag is that since plastic is so cheap, you will also find that these are the cheapest type of golf bags there is. There are so many different things that you can put into your golf bag to attempt to improve your golfing game. First and foremost you are going to want a driver, some irons and a putter. Without each of these 3 essentials you are going to find it pretty much impossible to play golf. Besides clubs, tees and balls are also essential items to keep in stock so that you actually have something to swing at. Since most golf courses are anywhere from 9-36 holes, it is always a good idea to bring with you water and snacks so that you don’t get hungry or dehydrated while you are out playing on the course; after all you will likely not have a snack cart follow you around to every hole. Once we get past the essentials, we get into the deeper aspects of golf and below I will make a list of some of the gadgets that you can and probably should bring with you in your golf bag. Range finder: A range finder is a device that you can look through and it will tell you how many yards away you are from the pin. This is a tool that can really improve your game because you will no longer be guessing which club you have to use once you figure out how far you can hit with each club; this comes in due time and practice. Divot fixer: This device is made from a range of materials but it generally is metal or plastic. Its purpose is to remove a divot from the ground which is a small impact hole that gets made when you hit the ball high up and it lands on the grass. The device itself is pretty simple, it is two prongs that you stick into the ground and you use it to pull the grass back up. Golf ball pick-up: this is a device that generally get put on the end of your putter. It is a round rubber seal that is used to pick up your golf ball after you putt it into the hole. This is great for older golfers or people who don’t want to bend over in general. Ball marker: This is a device that you put into the ground if you are playing with other golfers. It is a small pin that you stick into the ground so that you can pick up your ball and allow the person that is farthest away from the hole to shoot. After the person shoots you can then place the ball back to where it was previously and then take your turn when ready and able. Ball retriever: This tool is generally one that actually slides in with the rest of your golf clubs; many of these tools have grips on them just like a golf club and if you didn’t pull it out then you might not even notice the difference. This device generally has a trigger and a long expandable rod with prongs on the end. When you press the trigger the prongs will retreat inwards; this device is used to pick balls up and out of water holes, out of the woods, out of the actual hole etc. A towel: This seems like a simple one, but you should always have some kind of a cloth handy so that you can wipe off your ball or your club if it gets dirty. A dirty club or ball can completely ruin your shot and keeping them clean is essential to try and get as low of a score as possible. Golf gloves: The last thing I will put on the list is probably one of the most commonly used pieces of golfing equipment there is. A good golf club will keep you from getting blisters on your hands and will make it harder to lose your gripping position on the club so that you don’t mess up your shot. This is a very good question because storing your golf bag outside is generally not the best idea. You not only run the risk of the sun fading out the color of your golf bag, but you also run the risk of an animal or an insect army making a nest inside your bag and ruining the fabric as well as potentially some of the contents of the bag. Depending on where you golf, some golf courses actually have slots or lockers where members can keep their equipment which is always something to keep in mind. Another good spot you can leave your golf bag is in the back of your vehicle if you don’t do a lot of carrying things around during the off season. Your car will protect your golf bag from the weather, will keep it locked and safe from theft and it will also do the job of protecting it from animals. A couple other ideas are: you could put it in a shed, a garage or even in an empty closet within your home. A golf bag is a fair size but it can still easily sneak into a basement and not look out of place. Just remember that no matter where you choose to store your golf bag, golf clubs are expensive and you don’t want them to be easily accessible to potential robbers, or left out in the weather to fade and rust. Although golf bags may seem like they are pretty simple in design; there are a variety of features that can be included in a golf bag and you may want to look for a golf bag that contains some of these. Stand: This allows you to stand your bag upright so that you have easy access to your clubs on the course and so that you don’t have to pick up your bag off of the ground after each swing. Carrying handle: This is a nice edition to any golf bag and allows you to slug your golf bag around, generally over your shoulder. The carrying handle is a very nice feature that not only helps you out on the course, but it also helps you in taking your golf bag off of a golf cart or hand cart as well as getting it out of the vehicle if that is where you store your clubs. Tee holder: This is one very handy feature that is generally located on the top part of a golf bag so that it can be reached off of a cart or when the bag is leaning over onto its stand. Generally the tee holder is a series of loops that you can slide tees into, it is very handy and saves you from having to bend over and grab your tees at the start of every hole. Pockets: pockets are an essential tool to hold all of your golfing supplies. The position of pockets as well as the actual size of the pockets on the golf bag should be a huge deciding factor for you. If you are unable to fit all of your golf supplies not only is this going to negatively affect your golf game but it could also damage your equipment when you keep things too close together. Umbrella/ cover: Not all golf bags have this feature, but it is definitely a nice one and it helps to protect your clubs. Basically there will be a side pocket on the golf bag that contains a large button up hood that goes over top of your clubs. The cover helps to protect your clubs from rain and other harsh weather conditions and can be taken off and stored when not in use, directly back into your golf bag. Dividers: This was sort of touched base on earlier in the article, but it is a good idea to get a bag with lots of dividers so that your clubs aren’t rubbing up against each other potentially tearing up your expensive grips. Dividers can be of all sorts of different numbers but the latest trends include dividers that have 14 slots for your clubs; which is the legal amount of clubs that you can have if you are playing by the rules. Zippers: This is a small feature, but it can be one of the first things to go on a golf bag so it is a good idea to look at a couple of golf bags when you are shopping for one, in order to find one with a reinforced or double zipper so that the golf bag lasts you for a longer period of time. Towel: many high end golf bags have a built in microfiber cloth that you can use to clean off your clubs and balls when they get muddy. Carts: Depending on how you like to golf; you may want to consider getting yourself your own golf cart. No, that does not mean the ridable one that has a steering wheel either. A golf cart is a stand that has 2 wheels on it and a slot in the middle where your golf bag sits. There will be straps on either side of the middle slot and these can be used to hold your golf bag in place while you pull your golf bag around using a cart. Carts are pretty much only used if you are going to be walking around the golf course rather than using a riding cart. It is a lot easier to use your own golf cart than carry your bag around to each and every hole. Using a golf cart helps to take the weight off of your shoulders quite literally. Largely depending on what type of material the golf bag is made up of, the bag can last anywhere from 5 years to the rest of your life. If you buy a bag and it doesn’t last that long then it is of very poor quality or it was stored improperly. If you leave your bag outside each and every day then you cannot expect it to last nearly as long as one that was stored in a heated garage; this is something that you should keep in mind. Before storing your golf bag for the winter it is always a good idea to clean your clubs off and wipe down your bag to get off any extra dirt and debris. If you don’t do this before long term storage you may find it rather difficult to get the grime off when the new season begins and you will be left with a bag that not only looks unclean, but that should probably be replaced. Something you may not be aware of is that there is actually no difference between a men’s and a ladies golf bag. Occasionally, ladies golf bags will be a tad bit shorter than men’s golf bags, but there are a lot of bags out on the market that are literally the same height. This is an important factor to remember when you are shopping for a golf bag, because if you are a woman looking for a golf bag it never hurts to take a look in the men’s section and vice versa if you are a man looking for a golf bag. Best of luck finding the perfect golf bag to hold your clubs in, hope that you find one that will last you a long time and allow you to fulfill your golfing dreams. Learn more about the best golf bags at Where’s My Caddie.